American jazz/rock keyboardist Ben Sidran has had an extensive career in music, which dates back to 1970. He has worked along side such artists as Steve Miller, Eric Clapton and The Rolling Stones just to name a few, all while continuing a solo career. His latest release is a 3-CD compilation titled "Ben There, Done That," which features Ben Sidran's live performances from around the world, between 1975 through 2015. This new set features 27 previously unreleased live recordings that brought the music of Ben Sidran to clubs around the world. The set jumps back and forth between dates, beginning with one of the earliest recordings featured on this set, the highly energetic funk/jazz appeal of "Birk's Works." This is quickly followed by his more recent work of "The Groove Is Gonna Get You" (recorded in Paris 2015) and "The Funkasaurus" (recorded in Tokyo 2009), as Ben warms up the audiences with his stellar performances. The set includes many of Ben's originals, including "On The Road Again," "Let's Make A Deal/Absent Soul" and "Walking With The Blues." But, the some of the highlights come from Ben's many covers, including the uptempo swing of Willie Dixon's "You Can't Judge A Book," the quiet, lounge feel of Billy Joel's "New York State Of Mind" and smooth, classic tone of Nat King Cole's "Straighten Up And Fly Right." Most of this set covers his live performances of the last 15 years, but the third disc especially highlights his highly successful 1991 tour of Japan with the addition of jazz fusion numbers "Lip Service" and "Too Hot To Touch." The new 3-CD set also includes a 24-page booklet that includes brand new essays by NPR's "Jazz Alive!" Becca Pulliam and Zev Feldman from Los Angeles. Also included is a Q&A with Ben Sidran and Mark Ruffin ("Real Jazz" on Sirus XM radio). 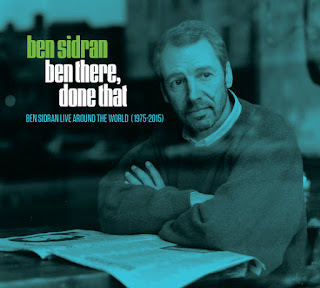 To find out more about Ben Sidran and his latest release "Ben There, Done That: Ben Sidran Live Around The World (1975-2015)," please visit bensidran.com.